1. Bud. The fire bubble looks like the bud of a flower. 2. Peony. When the first burst of sparkles appear, breaking the surface of the tiny molten ball, the shape is said to look like a peony. 3. Pine Needle. This is the stage when the sparkles are most active, shooting energetically and straight like a prickly pine tree. 4. Willow. The sparkles become a little sluggish as the hanabi nears its end, resembling the long strands of a willow tree. 5. Falling Chrysanthemum. 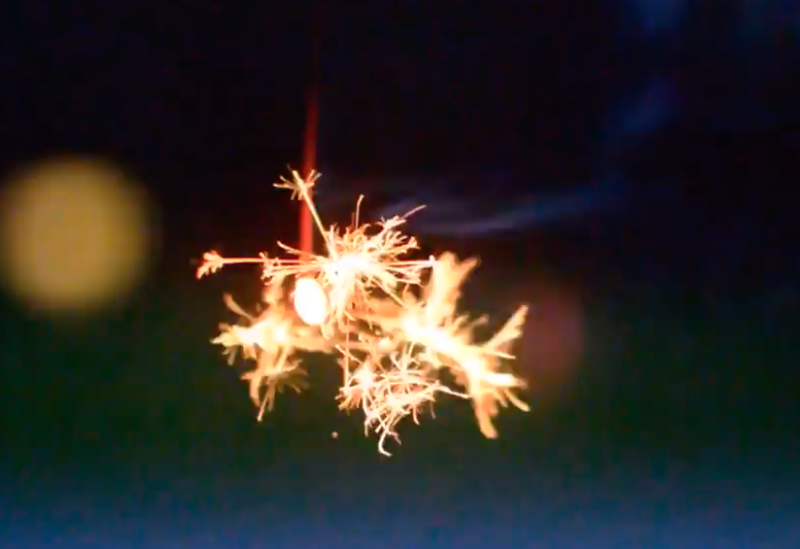 Right before the sparkler goes out, the pretty branching sparklies cease, there is once more a round fiery ball that drops off much like the way a chrysanthemum does when falls from its stem. If all of that isn’t impressive enough. The entire show happens in about ten seconds. It’s a good things they are cheap and there are quite a few in one package. The only thing to remember — and I’m reminded every time I use one of these sparklers — make sure you don’t hold it above your foot, because when that mini ball of magma falls its temperature is somewhere around 350 degrees Celsius/662 Fahrenheit . Ouch. So I give you the end of summer and the end of my two-week stint at BoingBoing, all beautifully represented in the short life of a senko hanabi.